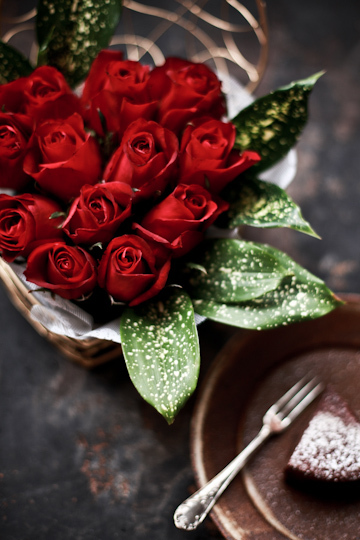 Aah, another St. Valentine's Day came and went quietly but quickly, like any ordinary Monday does. I hope you all spent a lovely time. As you may or may not know, St. Valentine's Day in Japan is all about chocolate. Period. It may often involve something romantic, but not always. But I have already gone on about how it is like, so I won't repeat it here. But I couldn't help but repeat one thing for the occasion, and that involved overloading myself (and family) with chocolate. For the past couple of years, I went out in town before St. Valentine's and braved the crowd to score some of the finest, much sought-after pieces and bars of chocolate, mostly at the event known as Salon du Chocolat. I've written about it, both the event itself and the chocolate I brought home with. But this year I didn't make it to any such event, partly because I am not in Tokyo where the entire place seems to be taken over by the chocolate fever; as a matter of fact, I am deep in the mountainous countryside where the only really "fancy" chocolate you'd find is a limited selection of Godiva bars at a local supermarket. Incidentally, the last Friday happened to be a public holiday (which I hadn't realized until Thursday evening) and we had a three-day weekend right before St. Valentine's. So instead of spending a small fortune on lavish, professionally made chocolates sold in beautiful boxes, this year I decided to take matters into my hands and come up with a few good homemade chocolate treats. 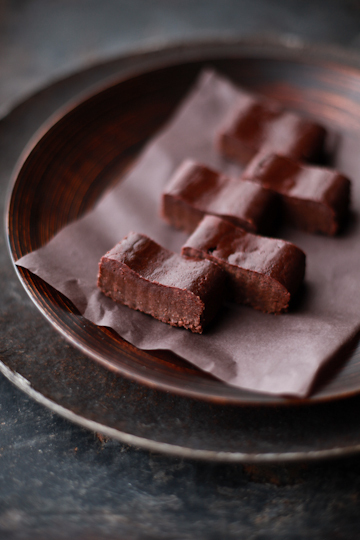 Chocolate by Trish baking chocolate, created by renowned Paris-based Irish chef and cookbook author Trish Deseine. She has authored a large number of cookbooks in both French and English, and more than a few of them are focused on chocolate recipes. 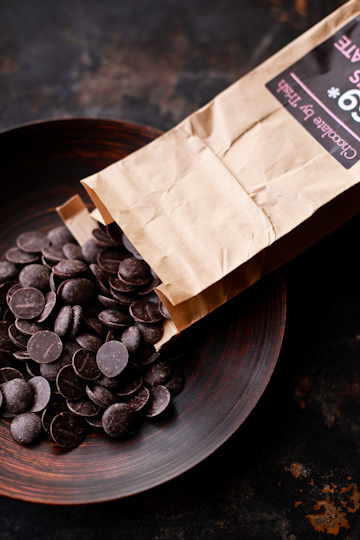 Among them, probably the best known would be Je Veux du Chocolat! (Marabout, 2002) (available in English as I Want Chocolate! (Laurel Glen Publishing, 2003)). I have been a fan of her recipes, which are mostly casual and simple yet manage to look sophisticated. I have several of her cookbooks that are all beautifully designed with gorgeous photography - well, my French is nowhere near good enough to read a newspaper or even children books, but I can manage to figure out cooking/baking recipes with a help of dictionaries and resources on the Internet in general. I have cooked and baked a lot from her books, and some of them have - sometimes with a little tweaking and substitutions - become my go-to recipes, including this oven-roasted warm fruit salad with salted butter, and pork casserole in hard cider, and of course, her famous melt-in-your-mouth chocolate cake that seems to have been made by chocolate lovers of every corner of the world. I have even been lucky enough to meet her in person - not privately, of course, but still as special as it gets for me. You see, a few years ago I happened to be staying in Paris for a couple of weeks, and one afternoon I went out in the city just to get a fresh air, after spending a whole week stuck inside working. I had nowhere particular to go to, and just wandered into a large bookstore in Les Halles. I headed to the cookbook section as I always do whenever I find myself in a bookstore. And there she was, sat at a small table, signing her then new cookbook that had just come out, along with several stacks of older titles. I remember being dumbstruck, unable to believe my luck - it was so totally random! And let's face it, my life is not exactly filled with encounters with chefs and cookbook authors I look up to. I chatted with her a bit, snapped a couple of pictures, and picked up her latest title which Trish had signed for me. I left the store still half shocked by the lucky coincidence. So imagine how excited I was last year to learn she was to launch her own chocolate brand in mid October. 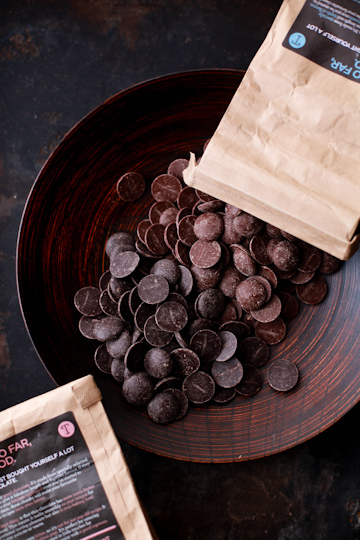 As a London-based brand offering fine French chocolate, most of their products are available only in the UK for now (soon to hit Paris, according to their website). But I was lucky once again; a good friend of mine in London was to come back to Japan to visit her family at the end of last October, and she was nice enough to get a selected few bags of chocolate for me at Selfridges department store, where Chocolate by Trish products were first made available for purchase. 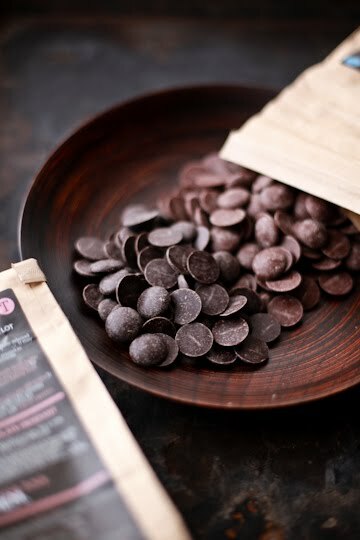 As I got bags of chocolate brought to me all the way from London, however, I did not open them up immediately but tucked them safely in the cupboard; it was partly because I had still not decided what to make with them - I wanted to do justice to them! - but mostly I didn't want to end up eating them all up before doing any baking with them. It was only too likely and I didn't want to be tempted. A few months have past since then and 2010 turned into 2011, and I have finally pulled them out to put them in some good use: dark and milk chocolate buttons, cocoa powder, and chocolate shards. Having flown from the other side of the world and spent a few months deep inside the cupboard, my precious bags of chocolate were now slightly battered-looking, but the chocolate inside did a perfect job and worked wonderfully well in cakes, puddings and cookies alike; the chocolate buttons melted beautifully (where necessary), extra-fine cocoa powder provided a deeply dark chocolate shade and flavor to everything it fell upon, and chocolate shards - though they got broken after the long transportation - still made a nice topping and made my desserts look pretty. So below are the things these chocolates were transformed into over the weekend - I hope you're not already full with chocolate, because I suspect you will be after these! The first thing I made was Trish's "My Favourite Chocolate Cake"; dense, rich, and super chocolatey, it may arguably be an ultimate chocolate cake with the unadulterated chocolate goodness. The list of ingredients is short and the method is very simple, so it's definitely a kind of thing that you'd want to use the best ingredients you can get. 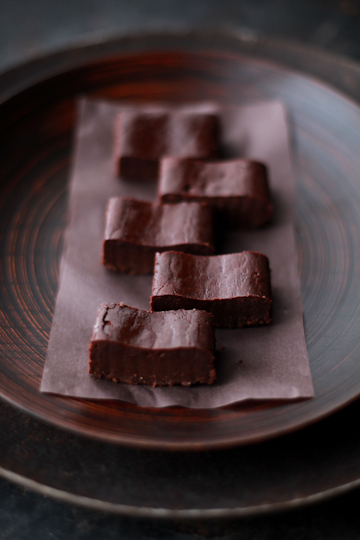 She shares the recipe on her site here - as well as a short how-to video. Should you decide to bake this cake (and you should, really), you might want to avoid the mistake I committed here: be extremely careful not to overbake the cake! I made my cakes in a smaller batch and baked in smaller pans than specified in the recipe, and should have been more watchful. They still came out wobbly soft, and tasted downright delicious though. Salted Caramel Milk Chocolate Mousse; now, doesn't that name alone sound good enough to make you want to go straight to the kitchen? I mean, Salted caramel! Milk chocolate! 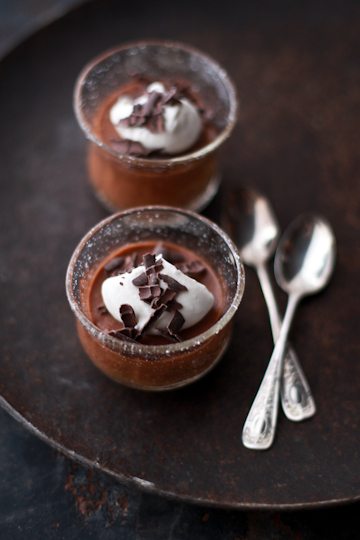 Mousse! Come on! And I consider myself a dark chocolate fanatic, but there is definitely something really irresistible about this milk chocolate beauty. You'll know what I mean if you've tasted it yourself. Not sure? Ask Fanny and Louisa - I think they'll convince you to try! The recipe appeared in Trish's book Du Caramel Plein la Bouche (Marabout, 2005), which is also available in English as Caramel (Whitecap Books, 2006). But now you can see Trish make it on a video; she makes it look like an easy job to make the mousse, and the good news is, it really is. You make caramel, then add cream, butter, chocolate, egg yolks, and whipped egg whites. Quite simple. Simple as it may be to make, it has layers of flavors - caramel, chocolate, and a hint of salt with the richness of butter and cream on the background. 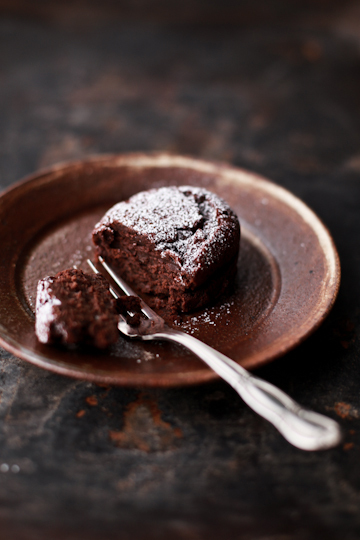 It's an extremely rich dessert, a sort you'd like to have in a small cup (like an espresso cup). 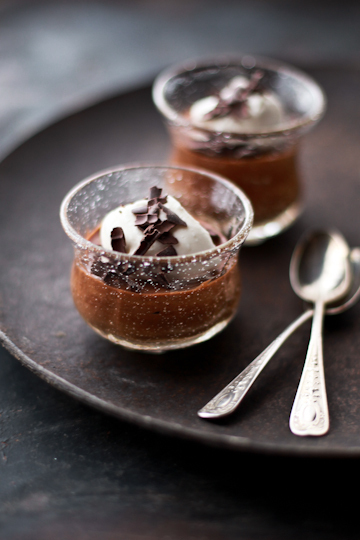 I served the mousse with a dollop of lightly whipped (unsweetened) cream and some of the dark chocolate shards, but it tastes great as is. That said, I should add that, in the video Trish suggests you should serve the mousse with nice crumbly shortbread, so I actually baked chocolate-chunk shortbread cookies (using roughly chopped chocolate buttons). But alas, I burned the cookies (typical...) and they weren't exactly presentable, so I didn't use them in the pictures. But folks simply loved the combination of the mousse and shortbread, so I highly recommend you try. 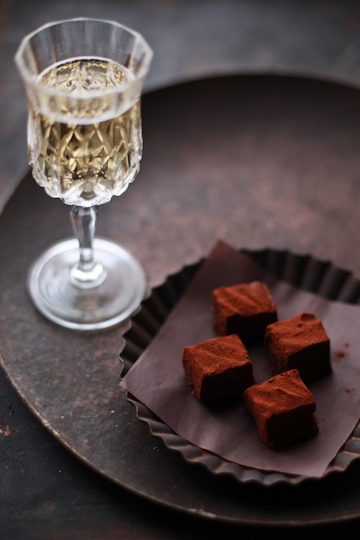 Champagne brownies! When I first came across Kelli's now legendary champagne brownies recipe, I swore to myself to try it. More than five years (!) have past since, and I've finally done it. Better late than never, right? 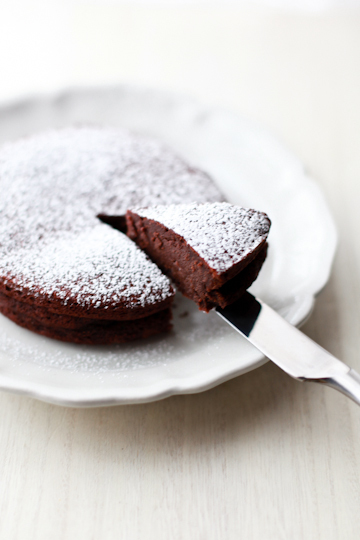 Other than adding a good pour of champagne (or some other sparkling wine) into the batter, they are quite a simple, straightforward brownies. But that good pour makes all the difference; the flavor of the wine shines though in every bite you have. And it's quite therapeutic to inhale the champagne-scented air while the batter is being made and the brownies being baked. Kelli makes glaze using champagne jelly for a finishing touch, but I didn't happen to have a champagne jelly sitting in the kitchen, so I simply heated a bit of sparkling wine and sugar in a saucepan to make 'champagne syrup', which I smeared over the brownies as soon as they were out of the oven. It seemed to do the job, for it gave my brownies a nice glow. Because I wanted to have nice, clean slices, I refrigerated my pan of brownie overnight before cutting into slices; it worked, but they were quite hard straight out of the fridge (as you can see in the pictures). Yet left at room temperature for a while and they became nice and soft and fudgy again. And oh, have I told you I love champagne? 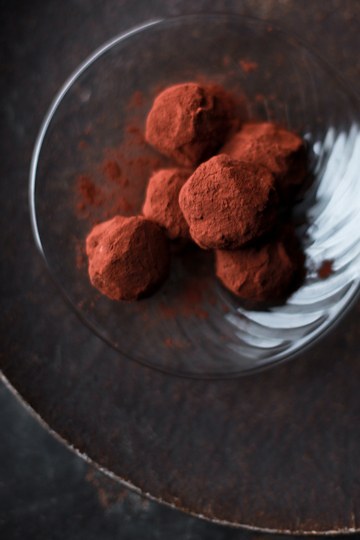 Good champagne truffles (those made using real champagne, not Marc de Champagne, which actually is a kind of brandy) are one of the most seductive things you'll taste in your life, and I thought it'd be nice to try to make my own. And the result of my first attempt is these Champagne Ganaches. I've once experimented to make "mulled wine ganaches" using red wine reduction flavored with some spices, honey, and a few slices of orange. They turned out rather nice, so I thought I'd try it with champagne in place of red wine, and minus the spices. Here I reduced champagne along with a few slices of lemon and honey, and added cream and dark chocolate. I've also throw some chopped candied orange peel into the ganache mixture before pouring it into a pan. They came out fine for a first attempt, but there was still much room for improvement; I think a few more trials should be in order before I can nail it down, and I hope I'll be able to share the recipe then. 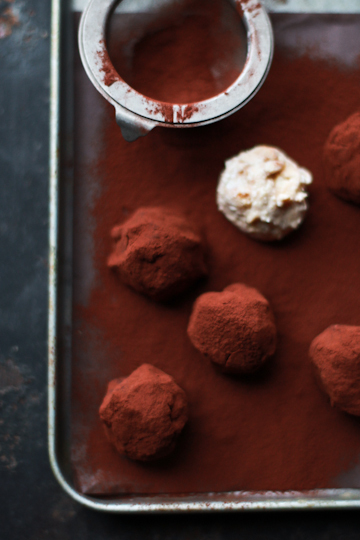 They are basically a mixture of softened mascarpone cheese and marsala-doused broken sponge pieces that is rolled into small balls and dusted in cocoa powder. They are truly tiramisu in a bite size, and super quick to make. Here I used ladyfingers, dipping them in a coffee syrup - very strong coffee sweetened with a bit of sugar and spiked with some brandy. The recipe does urge you to eat these FAST, and I couldn't agree more... these are a kind of food that taste the best when eaten straight from the pan/bowl. Personally, I wouldn't bother with a serving bowl or plate! 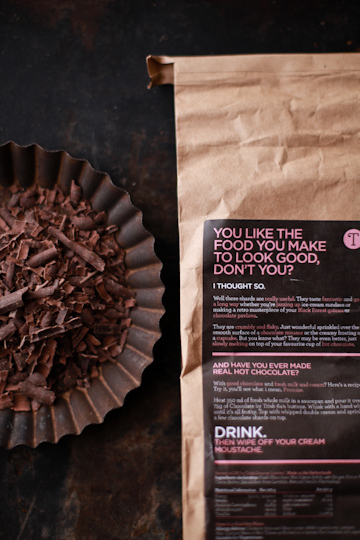 Chocolate for drinking = hot chocolate. Quite straightforward, I know. 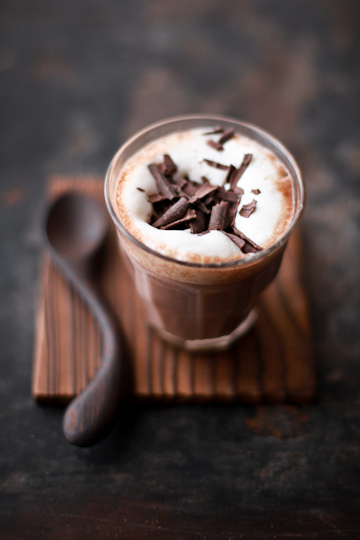 But this got a bit of twist to plain hot chocolate, by adding hoji-cha or roasted green tea, hence Hojicha Hot Chocolate. I like to play around with a lot of different flavor variations for hot chocolate, and I enjoy combination of chocolate and tea. I've tried different teas including matcha, Earl Grey tea, and jasmine tea. Now hoji-cha is green tea in essence, but the roasting process gives it a completely different profile, which pairs really well with chocolate. In fact, one of my all-time favorite chocolate is hojicha ganaches from an Uji, Kyoto-based tea house Nakamura-ya Tokichi, ever since I discovered them several years ago. Here I melted some dark and milk chocolate buttons in a very strong brew of hoji-cha in milk, and served each portion with foamed milk and chocolate shards on top. You can of course use cream in addition to milk, but it was rich enough with milk alone. ...well, actually two? So far I've had chocolate to eat and chocolate to drink, and here's chocolate to spread: Strawberry Jam with Dark Chocolate and Kumquat Marmalade with Milk Chocolate. Or you could call them fruit-flavored chocolate spread. Whichever rocks your boat. I know there is nothing new about flavoring chocolate with fruits, but somehow I never thought of adding fruit (jam) to chocolate (spread) until quite recently, at Salon du Chocolat Tokyo a few years back. There they had a huge line of Christine Ferber jams, which included chocolate spreads with raspberry, pear, mango, banana, and so on. I bought a jar of milk chocolate spread with orange, mango, and passion fruit there, and also got the bankan (a type of Japanese citrus a bit like grapefruit) marmalade with dark chocolate from El Ceibo. 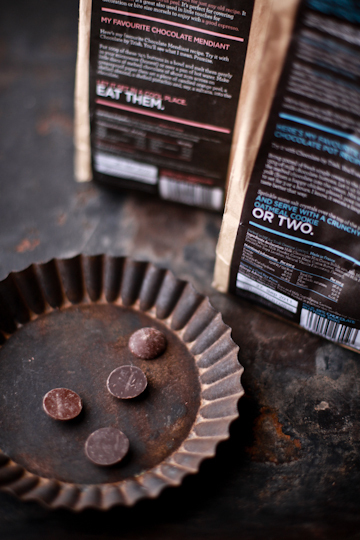 They both tasted excellent (so did their chocolate), and I was instantly sold. And last year I got strawberry jam with mint and dark chocolate from El Ceibo, and I fell for it; and that says something when I don't even like jams in general, and strawberry jam is usually my least favorite. I remember thinking I should try and do it myself too. Like so many other things, it took me a bit of time before I finally got around to actually doing it, but I'm glad I did it. 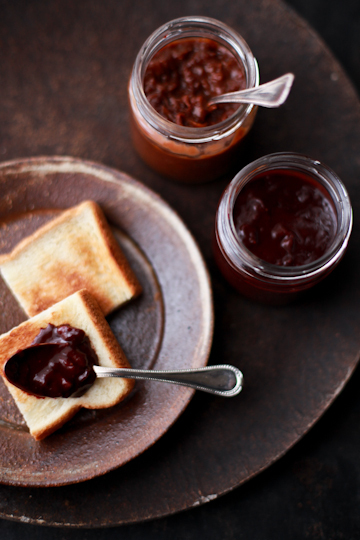 As I searched for recipes for fruit-chocolate jams on the Internet, I was surprised to find that there are quite a few around. 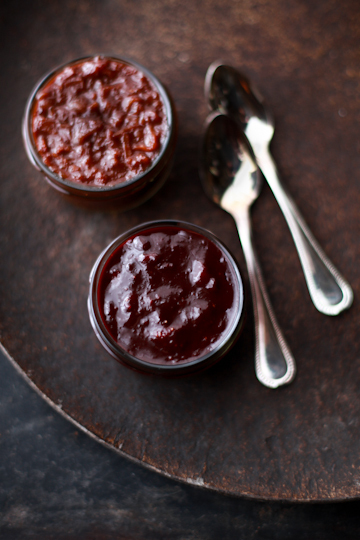 This time I used this recipe for chocolate strawberry jam, adapted from none other than Christine Ferber in her jam book Mes Confitures. The recipe requires very little cooking time, but you do need to let your batch rest overnight to allow the flavors to develop before finishing cooking. 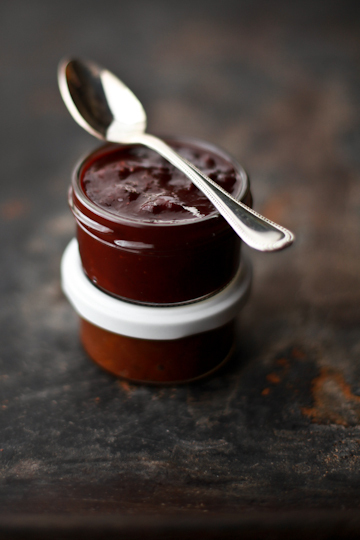 The result is deeply chocolatey spread with a fresh fruit flavor - much, MUCH better than boring strawberry jam, in my (biased) opinion. I made the kumquat-milk chocolate version using the same recipe, with a bit of extra preparation; I first cooked whole fresh kumquats in water for ten minutes or so, removed the seeds, and sliced everything (both peel and pulp). I also added a bit of water to cook the sliced pre-boiled kumquats with sugar before adding milk chocolate. It seemed to have worked. My spreads were ready to eat (or spread) as soon as they were cooled, but I found them tasting even better rested overnight. I will definitely make these again, using different fruits and perhaps adding herbs and spices. And it was a good thing that the spreads keep well in the fridge so we didn't have to finish them in a hurry. Because frankly, we had way too much chocolate stuff in the house over the weekend - yes, I made everything in just two days. You may call me crazy and you'd be right. For the record, I made everything in a small batch, and we only had a couple of small bites of each at a time. But that still made us (or me, at least) quite full, and in fact I was feeling full just making them. 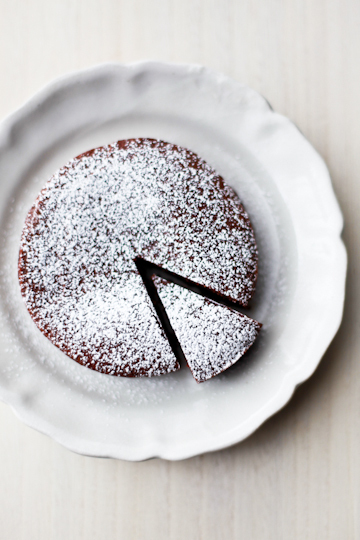 You know, there really is such a thing as too much chocolate. But at least the folks seemed happy with this state of chocolate overflow, and eager to sample everything I'd made. I was happy, too, that I made a good use of fine chocolate and turned them into a variety of different things. Overall, it was a good weekend, with a bonus of "leftovers" that we've been enjoying over the following few days. Speaking of leftovers, I am now left with only a handful each of chocolate buttons. And I think I'll enjoy them as a midnight snack... not right now, but maybe next week or so when I'm (hopefully) over with the chocolate overload. Chocolate overload aside, I hope you had your St. Valentine's Day loaded with love - either spending time with someone you love, or thinking about them. I know I did. What a visual delight ! Awesome post! Nothing shouts love like chocolate. WOW! Amazingly delicious and gorgeous photos Chika! 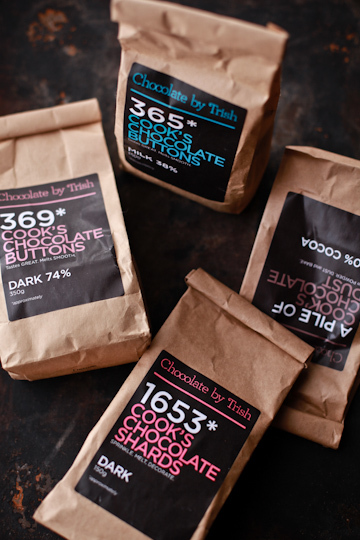 I love Trish's chocolate so delicious. Sent sweet shivers down my spine. Chocolate! 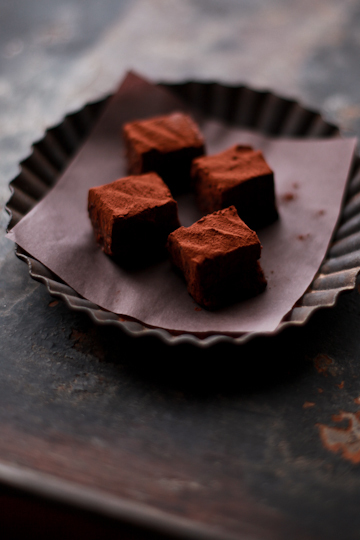 wow..simply love your gorgeous looking champagne brownies..would love to try some! Just outstanding photo and recipes. I will remember this post for Easter. Oh wow. Your photos are absolutely stunning. I've only just discovered your blog - it's so lovely to have come across it. Look forward to finding more inspiration on your site. dayle - do give the mousse try! way beyond delicious. Rowaida - yes they are! hoping to try some other products too. First item on my list of food stuff to buy in my Europe trip! Brilliant!! Thanks for sharing!